Last week I went to New York, and I could not help taking an abbreviated tour of the city’s most noted cupcakeries while I was there. Of course the iconic Magnolia Bakery topped my list, and I knew I had to try their cupcakes. With a line around the block, they’ve got to be good, right? Well I didn’t actually like the cupcakes that much. The frostings were super duper sweet and lacked much flavor, and the cakes kind of bland and on the dry side. I mean, they certainly weren’t the worst cupcakes I’ve eaten, but I don’t understand what all the fuss is about. In fact, my entire trip to Magnolia bakery might have felt like a waste, if not for one tiny Facebook comment from my friend Steve: “The cupcakes are really good but the banana pudding is insanity!” So, almost as an afterthought, I asked the guy who packed my cupcakes if he could add a banana pudding to my order. I am having trouble finding the right way to describe it to you. The first word that comes to mind, “heaven,” does not actually do much in the way of letting you know what I’m talking about. The standout feature of this pudding is its texture. Fluffy? Frothy? Cloud-like? And it practically disappears in your mouth. Turns out, it’s actually vanilla pudding folded into whipped cream! It manages to be rich and light simultaneously, with just the right amount of bananas and soft cookies to keep things interesting. Really, the bottom line is that you need to eat this pudding. Which, unless you live near New York City, means thank God for the internet! Because a quick Google search led me right to the recipe, reprinted from one of the bakery’s cookbooks. And now I’ve made it at home (yes, a mere 4 days after I returned from New York) and can tell you that I am not the only one who thinks it is fabulous. My husband, my roommate, and my friend Toby (the only ones who have eaten it so far) all agree with me wholeheartedly, and I am sure more converts will follow. A quick note: I was so anxious to share this recipe that I don’t even have any pictures to show you! Rest assured, the pudding not much to look at, but you should definitely make it anyway. Yesterday would have been my Nana’s birthday. She passed away this July, but a few days before she died, she shared this recipe with me. We were talking about the old Brown Derby restaurant in Hollywood, and she told me how she used to go there every night after work. They had this amazing grapefruit cake, she said, and she was sure she had a copy of the Brown Derby cookbook around the house somewhere. Ten minutes later, she put a small, yellowed paperback in my hand and said I could keep it, as she rarely cooked anymore and she knew I would use it. I never got a chance to bake her this cake, but her birthday seemed like a great day to try it out. And let me tell you, it is just as delicious as my Nana said it would be! The chiffon cake is moist and though I doubted that such a small amount of grapefruit juice in the recipe would really bring the flavor through, it absolutely does. The cream cheese frosting is not too sweet, and full of citrus flavor as well. As I’m not generally the biggest grapefruit fan, I would love to try this out with other citrus fruits, or even use the basic chiffon cake for other base flavors… but my mom has declared this her new favorite cake. Period. As layer cakes go, this was pretty simple to make. The cake is baked in a single layer and split with a knife, and the frosting spreads easily onto the prepared cake. Decorating with grapefruit is simple and beautiful, as long as you remember to save back the prettiest sections for the top of the cake! I made a couple little changes to the frosting, but seriously nothing major. 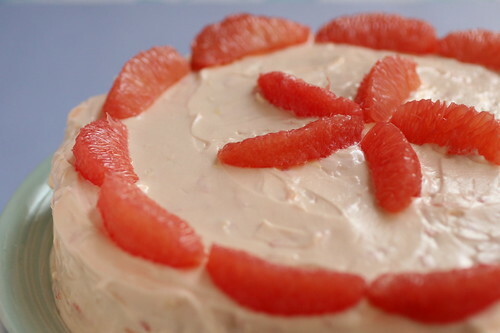 If you have anyone in your life who loves grapefruit or remembers spending nights at the Brown Derby long ago, bake them this cake. You won’t be disappointed. 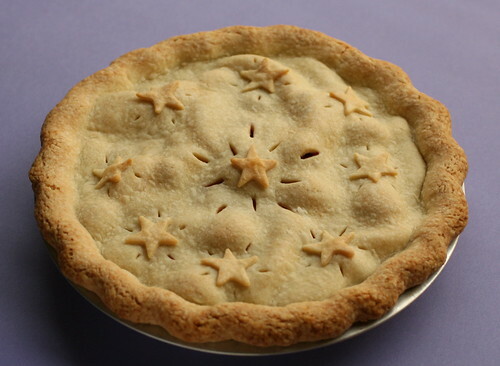 For starters, fruit pie filling usually seems too sweet and gloopy for me… cornstarch and a ton of sugar will do that, not to mention the blasphemy that is canned pie filling. Don’t get me wrong, I am a big fan of shortcuts! But canned filling is everything that’s wrong with pie. Here’s a better idea: frozen peaches. They’re picked at the peak of ripeness, peeled and sliced for you, and ready when you need them, any time of year. For this pie, I added fresh raspberries (they were on sale for $1!) for color, but you could use blueberries or blackberries instead, or just keep it straight peach if you prefer (I often do). My favorite pie crust recipe comes from the Williams-Sonoma book “Pie and Tart” but for the filling, I usually improvise.